The townspeople thought the end of the world was upon them. Though the robin-sized birds left quickly, their appearance was forever imprinted on local lore. As author Benjamin Smith Barton wrote, "The more ignorant Dutch settlers were exceedingly alarmed. They imagined, in dreadful consternation, that it portended nothing less calamitous than the destruction of the world." You and I know that the birds weren't a precursor of mankind's demise – but in a way, there was impending doom ahead. 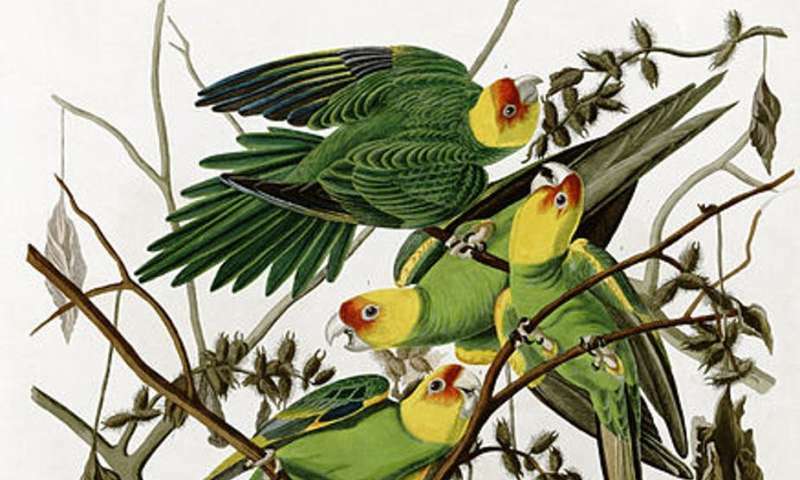 These birds were Carolina parakeets, America's only native parrot. Exactly 100 years ago this February, the last captive Carolina parakeet died, alone in a cage in the Cincinnati Zoo, the same zoo where the last captive passenger pigeon, named Martha, died four years earlier. The last "official" wild Carolina parakeet was spotted in Florida just two years later. Over the past six years, I've been collecting information about where the Carolina parakeet was observed over the last 450 years. I spent hours upon hours reading historical documents, travel diaries and other writings, ranging from the 16th century all the way into the 1940s. I've often become lost in the stories surrounding these parrot observations – from the first accounts of Europeans exploring the New World, to the harrowing tales of settlers traveling the Oregon Trail in the 1800s, to grizzled egg hunters scouring the swamps of Florida in the early 1900s. But birds are often seen in areas where they don't normally go. For instance, the range of the snowy owl – like Hedwig of "Harry Potter" fame – doesn't really extend all the way to Bermuda, though one was once spotted there. What's more, scientists don't know what really drove these parakeets to extinction. Some thought it was habitat loss. Some thought it was hunting and trapping. Some thought disease. A few even thought it was competition with nonnative honey bees for tree cavities, where the parakeets would roost and nest. Thanks to the data I compiled as well as cutting-edge machine learning approaches to analyze those data, my colleagues and I were able to reconstruct the Carolina parakeets' likely range and climate niche. It turned out to be much smaller than previously believed. Generally, their range extended from Nebraska east to Ohio, south to Louisiana and Texas. 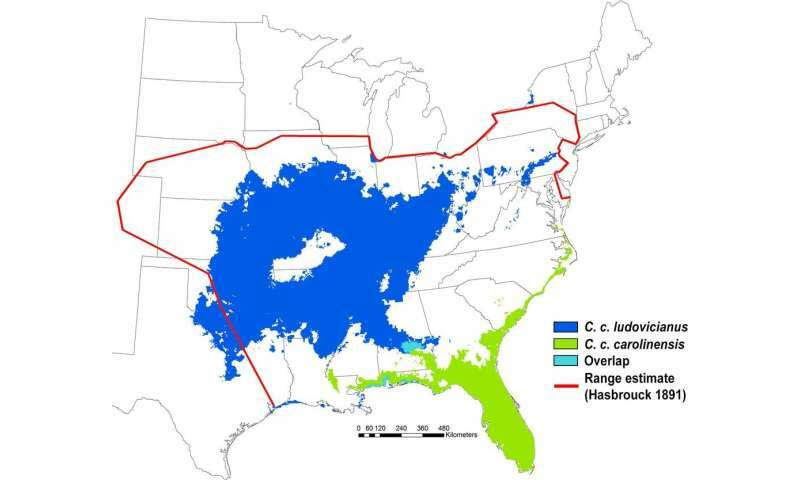 The eastern subspecies lived mostly along the southeastern coast from Alabama, through Florida and up to Virginia. In a world that faces extinction on a scale not seen in the past 65 million years, some of you may wonder: Aren't there more important things to study? While this may seem rather minor, some scientists consider the Carolina parakeet one of the top candidates for "de-extinction." That's a process in which DNA is harvested from specimens and used to "resurrect" extinct species, not unlike "Jurassic Park" (but way less action and decidedly less Jeff Goldblum). If someone were to spend millions of dollars doing all of the genetic and breeding work to bring back this species, or any other, how will they figure out where to release these birds? Given the effects of climate change, it's no longer a given that scientists could release birds exactly where they used to be and expect them to flourish. In many ways, the history of the Carolina parakeet's decline parallels the history of American growth over the course of the 19th century. All that prosperity came with many terrible costs. As the U.S. expanded and remade the landscape to suit its needs, many native species lost out.